Healthy, lightly-seasoned gyoza made using spinach. Simply boil, or pan-fry and steam-bake, to enjoy. 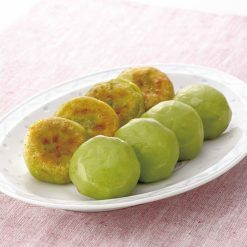 Package contains 200g (8 pieces, 25g each). Spinach is used in making both the wrappers and fillings of these round gyoza. The wrappers are springy in texture, and a pretty jade color. These gyoza are delicious either pan-fried or boiled and are made without garlic. Due to an increase in efficiency in production, each gyoza has become about 5 yen cheaper. To cook on the stove: Distribute 1 tablespoon of oil in a heated frying pan, then add the gyoza (still frozen). Add enough water (about 100ml) to submerge the bottoms of the gyoza, cover with a lid and steam-bake on medium heat for about 5 minutes. Just before the water has all evaporated, lower the heat a little and add 1 teaspoon of oil. Distribute the oil evenly throughout the pan. Fry for 1 to 2 minutes. When the bottoms of the gyoza look pan-fried, they are done.To use in hot pots or soups: Add the gyoza (still frozen) once your soup is boiling. The gyoza are done when they have all fully risen to the surface of the soup (about 8 minutes). The gyoza wrappers tear easily if they have been overcooked, so please use caution. 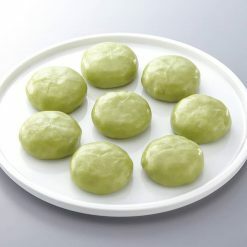 This product contains vegetables (cabbage (domestic), spinach (domestic), ginger), meat (pork (domestic), chicken), pig fat, granulated soy protein, sesame oil, soy sauce, sugar, table salt, fish sauce, oyster extract, pepper, wrappers (wheat flour, tapioca starch, spinach paste, rapeseed oil, table salt, konnyaku potato extract).. Origin of ingredients: cabbage/spinach/pork (domestic). Prepared and packaged in Japan.